The beauty industry means big bucks in Japan. Consumers are bombarded with a constant stream of advertisements for the latest cosmetic products on TV and the Internet, in magazines, on billboards and even on trains. It should come as no surprise to learn that Japan is the second-biggest national market for beauty products in the world. While Japanese consumers clamor for items that will make their skin smoother or their hair shinier, relatively few people are aware of the horror behind the products in their cosmetics cases. Until recently, the fact that many ingredients are still being tested on live animals received only lip service here in Japan. However, following major changes in laws on animal testing in Europe last year, the Japanese government and cosmetic companies are ramping up efforts to follow suit. 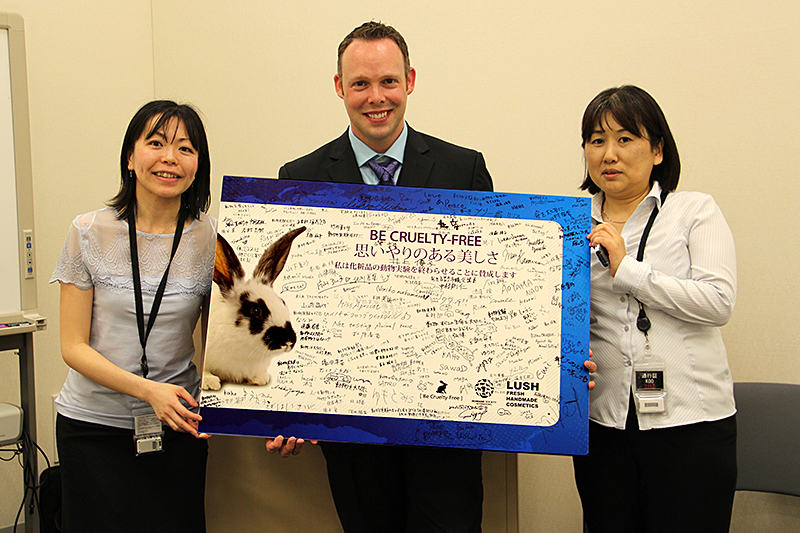 Last month, Diet members, scientists and animal protection group personnel gathered to share information about global trends in ending cosmetics testing on animals, with a focus on the implications for Japan going forward. One of the presenters at the forum was Troy Seidle, the director of the Research and Toxicology Department at Humane Society International (HSI). As the world’s largest nongovernmental organization involved with advancing non-animal testing, HSI plays a key role in working with governments, lawmakers, corporations and consumers. According to Seidle, Europe set the standard for the rest of the world when it became “cosmetics cruelty-free” in March last year. Israel, India and the Brazilian state of Sao Paulo have since followed suit, while nations including the United States, New Zealand and Australia have introduced similar legislative proposals. One of Japan’s biggest cosmetic firms has already taken the leap forward. 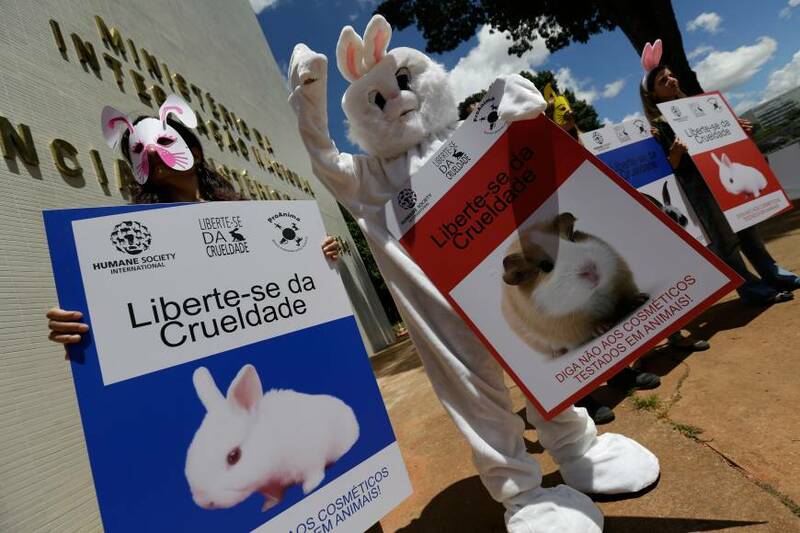 In line with the changes in Europe, Shiseido announced in March 2013 that it had ended all animal testing (with the exception of imports to China, which still demands that finished products imported from overseas be tested on animals). There are a number of smaller domestic companies that are already cruelty-free, including Miss Apricot, D-fit and Seikatsu no Ki, along with international firms that have become popular in Japan, such as The Body Shop and Lush. Founded in Britain in the mid-1990s, Lush opened its first store in this country in 1999 and now sells its colorful handmade bath, hair and skin-care products nationwide. Beginning in 2012, Lush teamed up with HSI to introduce the Be Cruelty-Free campaign in 12 international markets, promoting public awareness of animal testing. 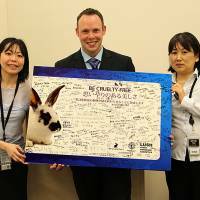 Emi Akiyama, the charity campaign supervisor for Lush Japan, partnered with HSI’s Japan-based consultants to launch the Be Cruelty-Free campaign here earlier this year. She admits it is challenging to educate the Japanese public about cosmetics testing on animals. 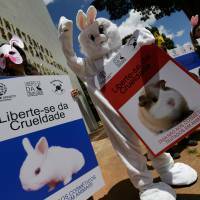 “In Europe, consumers were the ones who initiated the movement to change the laws on animal testing. That isn’t the case here,” says Akiyama. On a positive note, however, she says that a growing number of customers and potential employees alike are seeking out the firm specifically because of its commitment to cruelty-free cosmetics. In the West, the cruelty-free movement dates back to the 1970s, when animal-loving consumers lobbied for an end to tests that included force-feeding cosmetics to animals until they died and repeated applications of substances in captive animals’ eyes or on their shaved skin. In a country that is said to be experiencing a pet boom and where many owners treat their pets like cherished children, why hasn’t similar concern emerged for laboratory animals? Consumer attitudes to cosmetics testing on animals were gauged in a recent online survey sponsored by Lush Japan with input from HSI. While only 30 percent of participants had previously heard about the issue of testing of cosmetics on animals, 85 percent said that alternative testing methods should be made available. Yamazaki says education is a key factor in changing the status quo. Seidle agrees that consumers certainly have a part to play. “If they buy an animal-tested product, they’re essentially telling the company, ‘Way to go, keep on doing it,’ ” he says bluntly. However, he notes that consumers and manufactures are just two sides of a square, with government and scientific researchers making up the other two. “This isn’t just appealing to people to end animal suffering. It is also about sitting down with policymakers and research institutions and examining the alternative testing methods that are already available and moving domestic policy in line with global trends,” Seidle says. One of the side-effects of the EU cosmetics bans is a major upswing in governmental and corporate research funding to develop and validate animal-free approaches to safety testing. Today, this research is paying dividends with cutting-edge, human biology-based testing tools that outperform the 1940s-era tests they’re designed to replace. For example, today companies can choose reconstructed human skin models instead of rabbits to test for skin irritation, or a rapid cell test instead of guinea pigs to test for sunlight-induced phototoxicity. Such methods have been scientifically validated and accepted by government health regulators worldwide. Although perhaps relatively little known, Japan already has an agency set up to deal with these issues. The mission of the Japanese Center for the Validation of Alternative Methods (JaCVAM) is to focus on the “3Rs” in terms of animal experiments for evaluating the safety of chemical substances: reduction of animal use, refinement of testing processes to promote animal wellbeing and replacement of animal tests with alternative methods. Established in 2005, JaCVAM operates under the auspices of the National Institute of Health Sciences and is headed by Dr. Hajime Kojima. Kojima notes that information exchange among the government, researchers and manufacturers is essential for moving forward. HSI Japan’s Yamazaki is hopeful that recent trends will lead to heightened efforts to ban cosmetic testing in her home country once and for all.